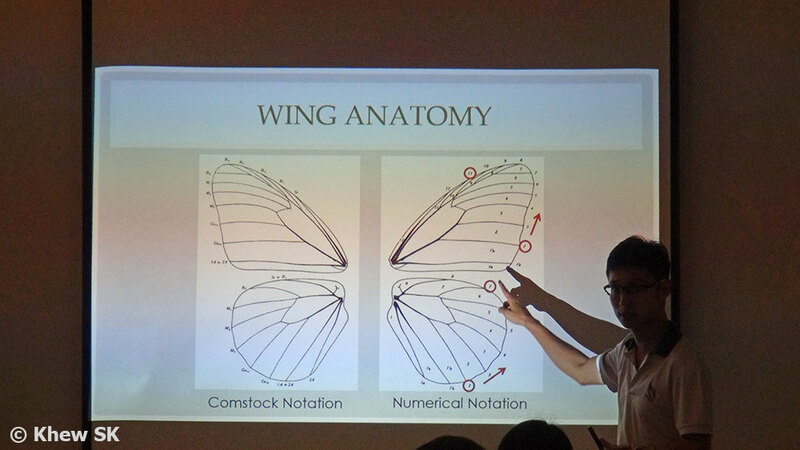 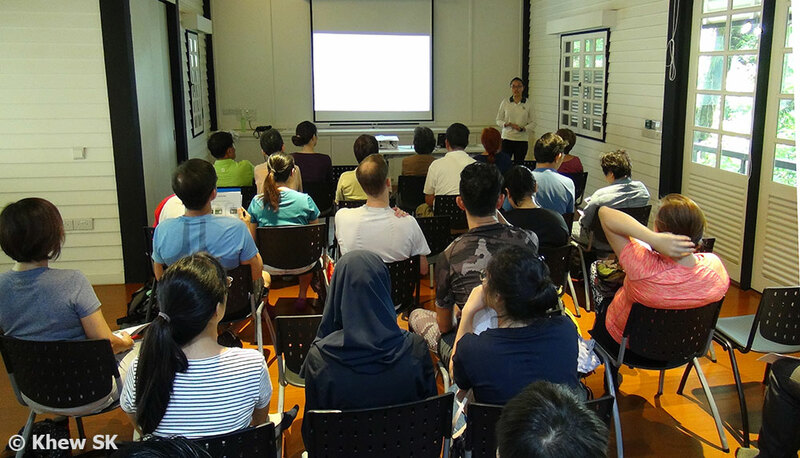 I recently attended a talk by NParks' staff Zhou Boyi (Conservation Division) and Joy Wong (National Biodiversity Centre Division) on an advanced programme for the Butterfly Watch volunteers - Phenology or the study of annual seasonal or cyclical timing that affect butterflies in Singapore. Thus far, NParks' Butterfly Watch surveys, which were spun off from the BioBlitz activities, have received enthusiastic interest from many active members of the public. 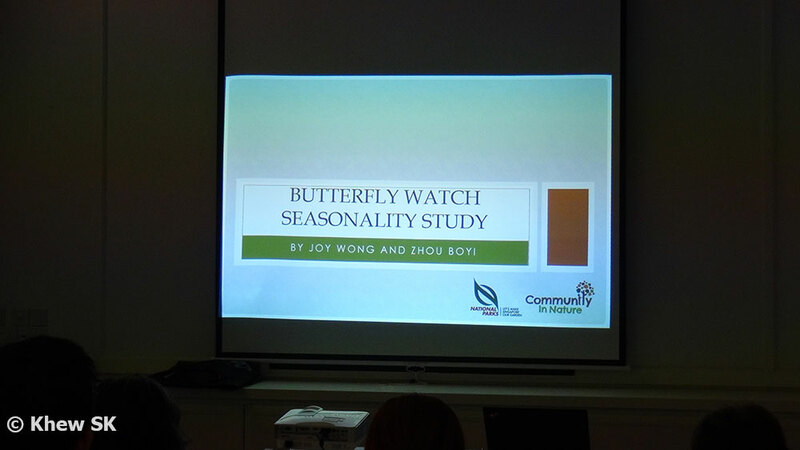 Boyi informed me that the talk on butterfly phenological surveys was the next step to document more advanced studies on butterflies and encouraging the public to see and learn more about their observations of butterflies in Singapore. It was also important to collect data and records of various species, their seasonality and correlation with various events (e.g. 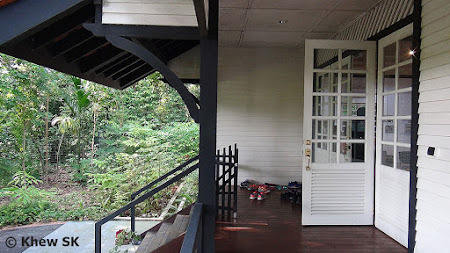 haze, exceptional rainfall, drought, etc) over the course of the entire year. 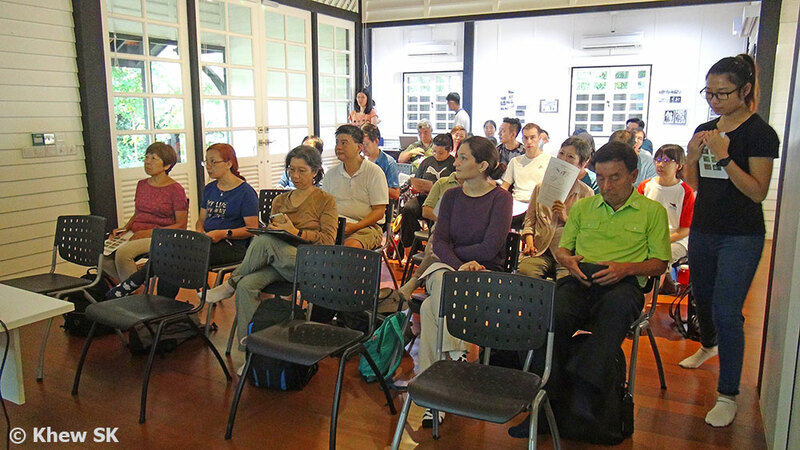 The talk was held at the renovated bungalow at Dairy Farm Nature Park. 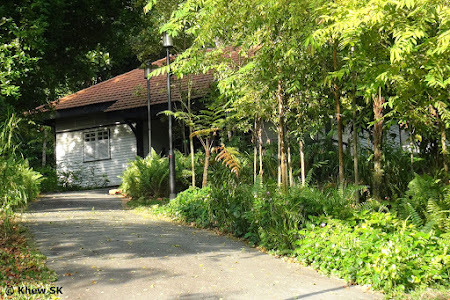 The old bungalow was dilapidated for many years and was believed to be the residence of the staff, chief veterinarian and General Manager of the Cold Storage company that ran the dairy farm back in those days. After renovations, the bungalow is now used by NParks as a research and education centre. The layout of the bungalow was somewhat different from its original living room flanked by bedrooms. Today, the space has been reconfigured as a large lecture room complete with airconditioning. Joy opened the talk with the background and purpose of the next phase of surveys which are intended to analyse the seasonality of the observations. She shared the various factors that affect phenology such as climate, differences in habitats, temperature, vegetation and a host of other factors. 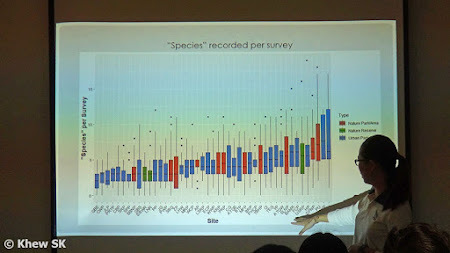 A graphical analysis of the data that was collected over the many ButterflyWatch surveys by numerous volunteers was presented. 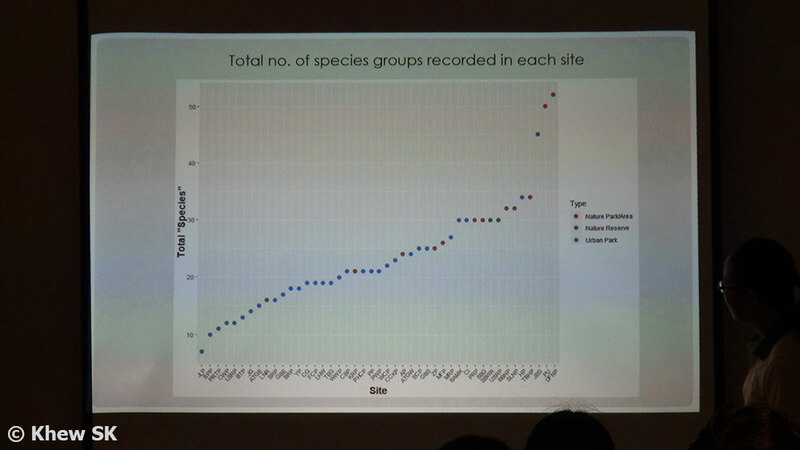 It was interesting to see the trends across the various sites and the species distribution and diversity at different sites. Coincidentally, the site that recorded the highest number of species over the surveys was Dairy Farm Nature Park, where the talk was held. 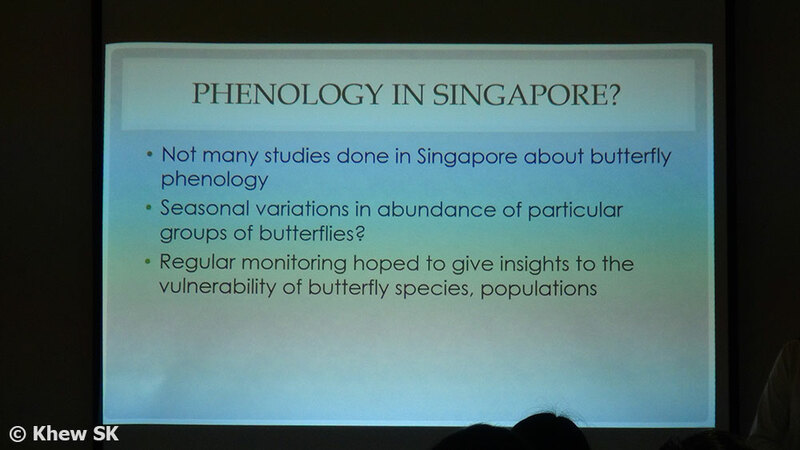 There have not been many studies done on butterfly phenology in Singapore. 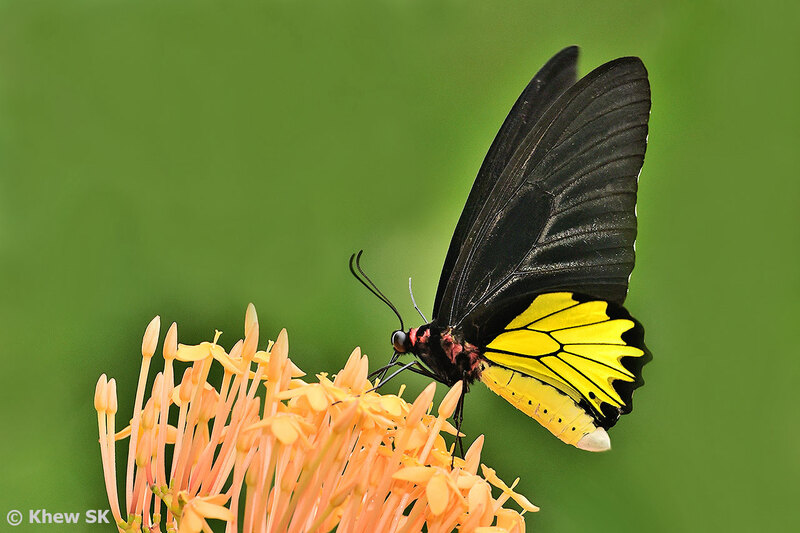 The purpose of collecting more data would be to study the seasonal variations in the abundance of butterflies and understanding the conditions which cause these variations. 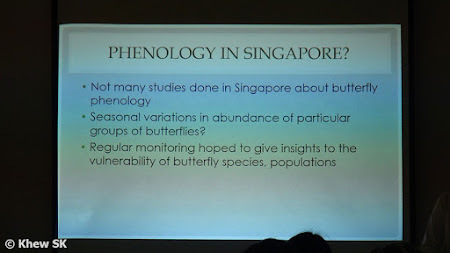 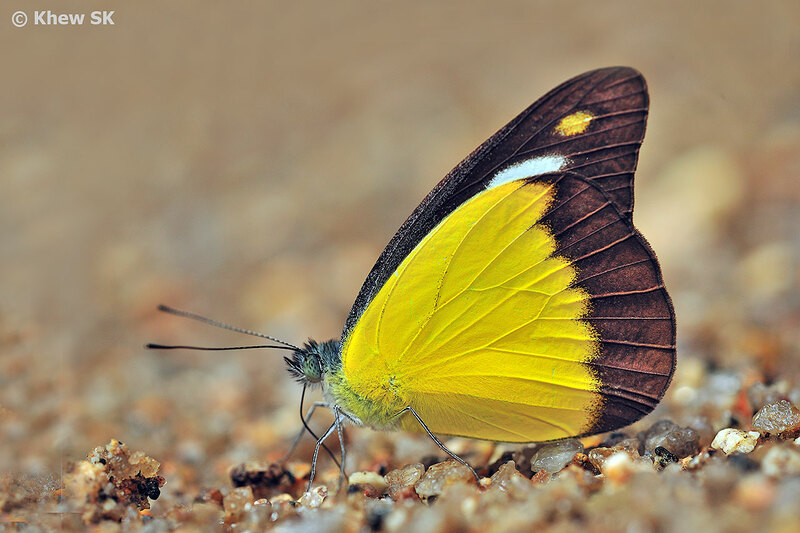 Regular monitoring will add to the body of knowledge about the vulnerabilities of butterfly species and populations and devise management strategies to sustain Singapore's butterfly diversity. 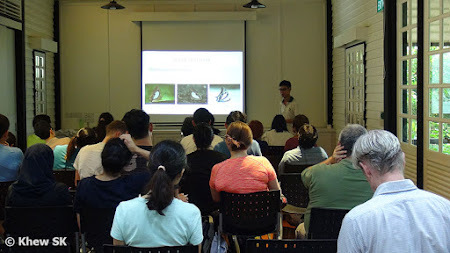 Boyi then took over the next series of slides to introduce the various butterfly families found in Singapore. 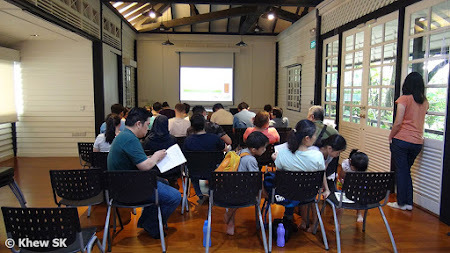 Each family's characteristics were discussed and their morphological attributes and differences highlighted. 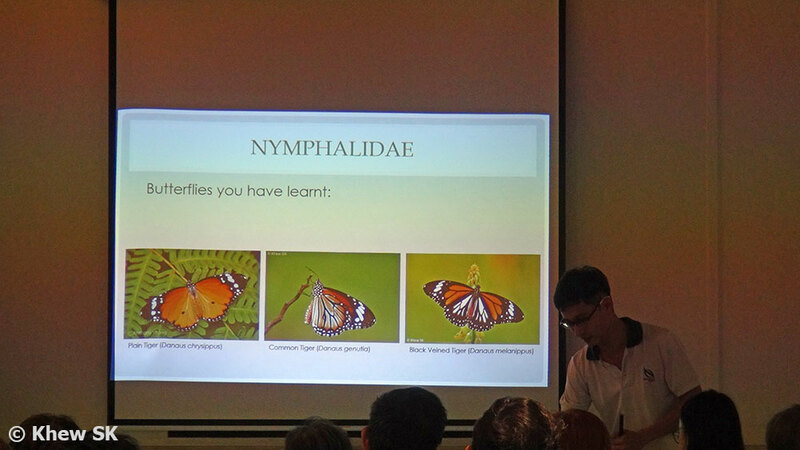 Lots of colourful pictures were shown to illustrate the features that Boyi was emphasising in his talk. 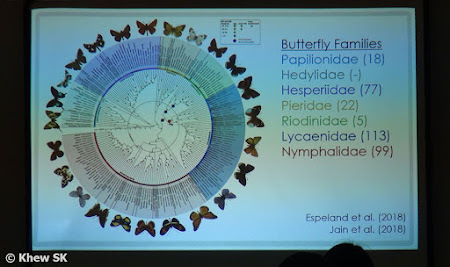 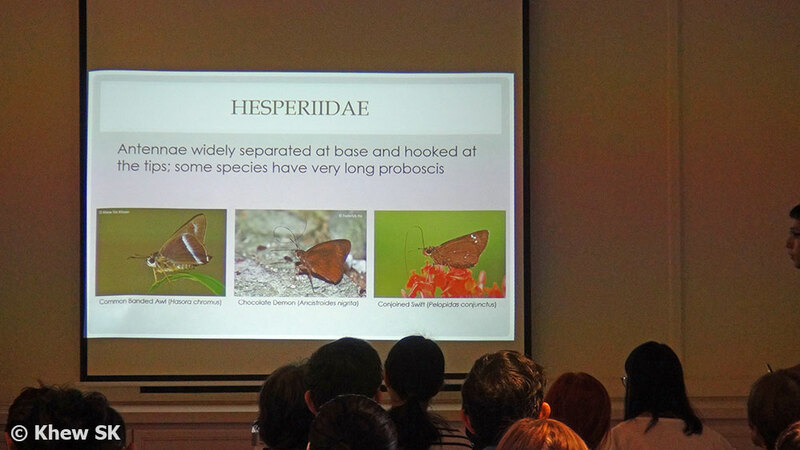 Boyi ended his talk with some quizzes on identification of butterflies and also featured a number of the more cryptic species that look very similar to each other. 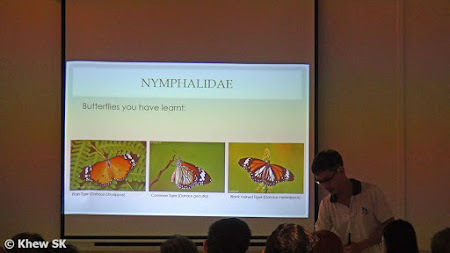 He also discussed the anatomical features of the butterflies and the scientific terms that are used to refer to different parts of a butterfly's wings. 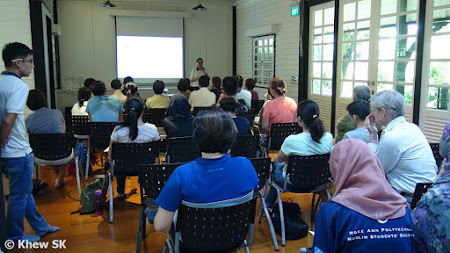 Joy then summed up the day's presentation with the details on how the volunteers are expected to record and submit their results to NParks to collate and analyse the datasets. 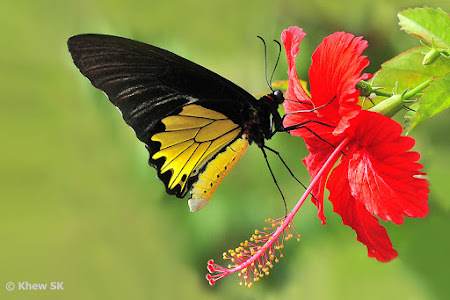 It would be interesting to learn about some of our seasonal species like the Chocolate Albatross (which makes its appearance during certain months of the year) or why the Common Birdwing can be abundant during certain periods of the year but disappear completely from its favourite locations, only to reappear in numbers again cyclically. 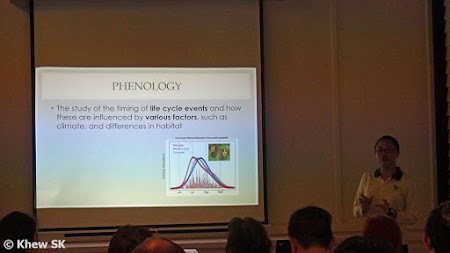 Are these seasonal appearances caused by plants, temperature, humidity, predators, parasites/viruses, environmental changes and a host of other factors? 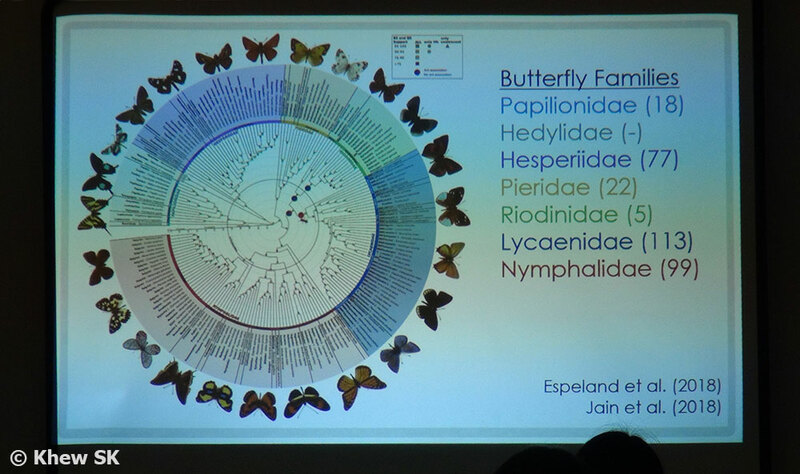 This is what longer term butterfly phenology studies can hope to give possible answers to these mysteries. 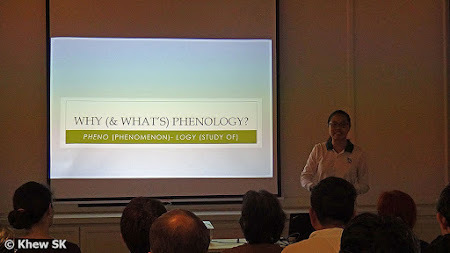 Text and photos by Khew SK. Special thanks to NParks for organising the talk and to Joy and Boyi for delivering an interesting lecture on phenology.